August 25, 2010 was a very special day in our lives. Very special. I remember everything so clearly. The blue skies, birds chirping, bright sun shining its rays down on us… the knock on the door by the delivery guy. I will never forget that day – the day that our ice cream maker arrived at our doorstep. I remember feeling excited – I would finally be able to make a dessert that Seth would love. He never had much of a sweet tooth, except when it came to ice cream. And I felt powerful – the ability to make this sweet treat was now in my control – take that milk and cream! Of course, once I realized I would have to wait a day to make ice cream, because the bowl of the ice cream maker has to be chilled, I was super disappointed. Ever since its initiation by freezer, however, it has been one of the most beloved appliances in our kitchen. I can’t even remember what life was like without it. 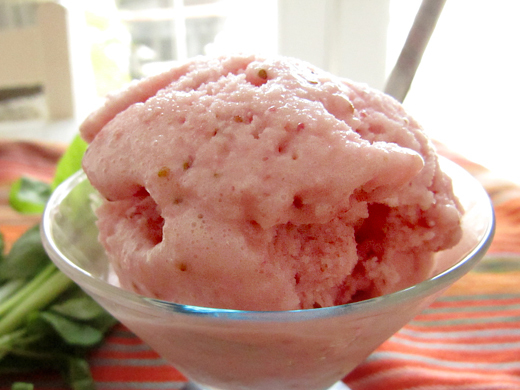 Our most recent concoction is this strawberry lime basil sherbet. I wanted to take this fruit salad, whose flavors worked so well together, and make it into a cold ice cream treat. It tastes fruity, yet unique, and is just perfect for summer. To make the basil syrup: Place sugar, water, and basil in small pot. Gently boil until the sugar has dissolved, about 8 minutes. Take off heat and strain out the basil. Chill. To make the sherbet: Use a blender (I used my trusty immersion blender) to puree the strawberries, milk, basil syrup, lime juice, and lime zest together. Churn in ice cream maker according to manufacturer’s directions. I find that this doesn’t freeze particularly well, so if you do freeze it, you may want to take out the sherbet 20 minutes before you serve. Let me begin with YUM! I read your post/recipe and promptly put my ice cream maker in the freezer (it's the kind that doesn't use salt and ice, but has to spend some time in the freezer before using it). I love the flavor combination of this sherbet and can't wait to try this. Thanks for sharing! I am imagining in my mind how refreshing this must be!!! YUM!!! A very special day no doubt! This sounds wonderful! I love strawberry and basil together! Mine has been in the freezer since last summer and I have only used it once. Shame on me. This looks delectable! Love the combo. I lol'd at remembering the date. I have no idea what day I bought mine but I do remember drivin 3 hours to Melbourne to pick it up, going back home and instantly plugging it in and making some. Thankfully I don't have to wait but I would cheerfully do so if that was how to get ice cream. Love the strawberry, lime and basil sherbet. yum. I love the addition of citrus and basil in this sorbet, it should be so refreshing! The basil and strawberry combo sounds interesting and delicious! looks amazing! Ice cream machines are both dangerous and wonderful. I have no excuse not to make all these grand recipes that appear - and now I have yours - which just celebrates summer and its berries and herbs! Wish I had some basil, the grasshopper have just annihilated our garden! Lovely notes of flavor in this ice cream, I would be glad to have a scoop of this to beat the heat. Delicious recipe! You should link this to the Ice Cream Love hop! I love using herbs in sweet dishes. I had the best pineapple cilantro sherbert once that I was going to try to dupe but haven't ever gotten around to it! Aw, what a heart-warming story :P Michael is the same way-he doesn't love sweets like I do EXCEPT when it comes to ice cream! I know I can't wait to get an ice cream maker! It will be a great addition to our ice-cream bloghop!! I did the same thing the first time I used my ice cream maker! So frustrating. however, this sherbert is just beautiful. It looks like a wonderfully refreshing summer treat. Wow, this sorbet looks fantastic! Girl, this looks awesome, and I love the flavor combo. Just thought I'd let you know that I dig your blog so much that I put you on my Fav Foodies list. oh yum!!! Perfect treat for the hot summer! Love the basil, what a creative idea! This sounds so refreshing! Sherbet always reminds me of my childhood. We always had it around. Dear Jenn, I love this! What a great post. I thought perhaps a birthday or anniversary but the day your ice-cream maker arrived was just great! I bet the inventions are limitless. All you need is imagination. Your so lucky to have an ice cream maker. This sherbet looks so yummy. I love the combinations of flavors. Refreshing and absolutely delish!!! That picture is just perfect! That narrative is fabulous! I wish I could remember the date our new ice cream maker arrived. I love sherbet and this flavor combo looks amazing. Haha my parents' anniversary is August 25 so I was getting really excited cause I thought you were going t say it was YOUR anniversary :P. But ice cream maker-versary is just as important! This flavor combo sounds amazing! This sounds so refreshing! I love the combination of basil & lime, and strawberries & lime, but had not thought to put them all together. I love this! Strawberry, basil and lime!! I love these flavors. Wow, this looks fantastic. That is a cool combination of flavors, never would have thought of strawberries and basil but it makes sense now you've created this. Refreshing. Strawberry and lime are so delicious together! I can only imagine how great it becomes with some basil. Looks like such a nice, light dessert for the summer :) I am breaking out my ice cream maker this weekend! This looks so delicious and refreshing for a hot day! I love the addition of basil to compliment the strawberries! I totally thought you were going to say your wedding day! HA!! Getting an ice cream maker is right up there :-) LOVE the sound of this sherbet!! love strawberry and basil together! no if only it gets warmer here soi can whip up some ice cream. Have got to try this. An ice-cream maker has been on my to-buy list somewhere at the bottom. But after seeing this, it's moved way up... a lovely simple recipe for something that looks so delicious and I'm certain tastes great too. I have missed this post. Basil in sherbet? That's a fun experiment for me to try. I love strawberries in cold dessert like this. What a refreshing look!